Buhari Not Happy With Osinbajo Over Sack Of Daura? 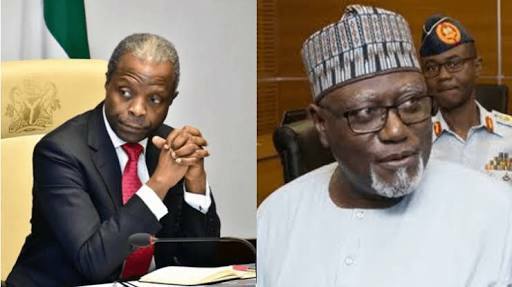 President Muhammadu Buhari is said to be angry over last week’s sack of Lawal Daura, former Director-General, Department of State Services (DSS), by Acting President Yemi Osinbajo. Was is supposed to be suspended and not sacked? He continued: “I can tell you authoritatively that President Buhari was not in the know before Daura was fired. Given Buhari’s style, he wouldn’t have fired him immediately like the Acting President did". "I believe the Acting President, a very tough and disciplined man, has had enough of the insults from the cabals and decided to put his foot on the ground by using Daura as a scapegoat. “I believe, with the development, other powerful appointees who had hitherto taken Osinbajo for granted will now sit up and know they can lose their jobs before President Buhari’s return and any action taken by the Acting President may likely not be reversed, especially if it is in national interest and is applauded by majority of Nigerians and the international community". “I understand the Acting President also decided to fire Daura to exonerate himself and prove to Nigerians that he knew nothing about the invasion. “I think the DSS was trying to rope him in when they said they barricaded the National Assembly after ‘order from above’. “When people hear the word ‘order from above’, the impression they always have is that the order is from the president. Also speaking to Daily Independent, another credible source said: “If you look at the statement by Femi Adesina, he never categorically said President Buhari endorsed the sack. “He only said the Acting President has the full powers of a president which he exercised. There is nowhere Adesina said President Buhari was briefed and he gave his nod for Daura’s dismissal. There are still some issues there which remain unresolved. “From what we know, the Acting President takes full responsibility for the actions and he is ready to damn the consequences. “If you know him, he is a very contented man and he is more of a technocrat than a politician. If you remember in May this year, he said he was ready to resign..."
In its reaction, the Peoples Democratic Party (PDP) said it was not surprised that President Buhari was unhappy over the development. Kola Ologbondiyan, the party’s National Publicity Secretary, said even if the president had decided to punish Daura, it won’t be as fast and drastic as done by Osinbajo.